Reedann’s Girl Crush made the long trip to Kansas City a worthwhile one, winning in her only appearance there to be crowned the Ladies Three Gaited Over 2 Champion with Owner/Trainer Alicia Owens in the irons. Before the show was over, “Aria” was sold and off to her new owners, the Kachel Family, in Wisconsin. Watch for Girl Crush in 2018 under the direction of new trainers, Clean Sweep Farm! 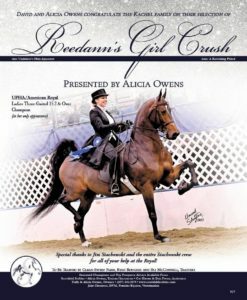 After over a year of looking for a Ladies 3 gaited prospect, Girl Crush was discovered in Colorado, and was selected by Alicia and Tuffy Owens in August of 2014 as a very green 3 year old. With two years of careful training and a winning debut season in 2017 in the Park division, the decision to trim her was made less than 24 hours before her class at the Royal. Girl Crush proved to be worth the wait, and the division change proved to be the right move, with Girl Crush closing out her career under the Scottfield banner with the big win at the UPHA National Championship Horse Show in the very division for which she was originally selected. Best of luck to Girl Crush’s new owners and trainers– she is an exceptional mare! ← Stylish In Black Sold to New Home!